The Norwegian state facility operator, Statsbygg, has awarded ICEconsult a multiyear contract for implementation of nation-wide facility management system using MainManager (www.mainmanager.com). The contract was signed 29th of February at a formal event in Oslo. This agreement is by far the largest the company has made and is a tremendous recognition and opens doors to new markets. The decision was made on the basis of intensive tender and negotiation process that began early last year. 11 companies across the Nordic countries participated. 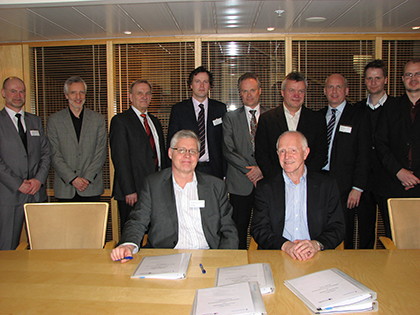 Three of them were selected into the final phase, two Norwegian companies and ICEconsult. Statsbygg’s decision process included evaluation of the software, experience and vision as well as cost. The result was decisive as ICEconsult / Main Manager was awarded the highest rating in all aspects. On behalf of the Norwegian government, Statsbygg owns 2,350 buildings distributed among 600 property complexes at home and abroad. These include universities, office buildings, historic structures, prisons, royal buildings, embassies, etc. MainManager is a comprehensive Facility Management system (CAFM) used in thousands of buildings in Europe. The system supports FM processes such as development, maintenance and operations projects, construction, service level agreements (SLA), lease management, quality management, energy, etc.